The chip antenna market was valued at USD 1.28 Billion in 2015 and is expected to be worth USD 2.99 Billion by 2022 The base year used for this study is 2015, and the forecast period is between 2016 and 2022. This report provides a detailed analysis of the market on the basis of product, application, end-user industry, and geography. A chip antenna is a compact antenna that is used for transmitting and receiving radio frequency signals in different wireless applications, including Bluetooth/Bluetooth Low Energy (BLE), dual band & multi-band, global positioning system (GPS)/global navigation satellite system (GNSS), and WLAN/WiFi. The top-down and bottom-up approaches have been used in the study to estimate the size of the chip antenna market. 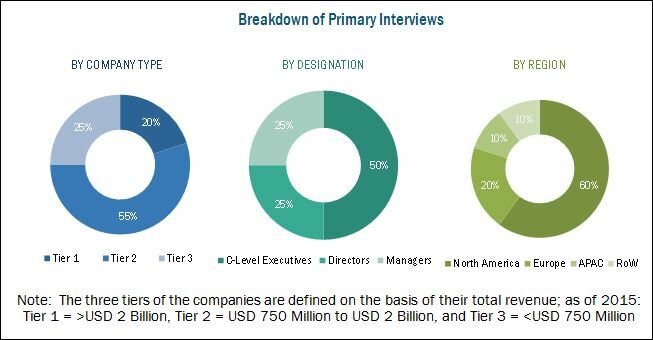 The research methodology includes the study of annual and financial reports of top players, presentations, press releases, journals, and paid databases, and interviews with industry experts. Additionally, the average revenue generated by companies according to the region was used to arrive at the overall market size. This overall market size was used in the top-down procedure to estimate the sizes of other individual markets via percentage splits from secondary and primary research. The chip antenna ecosystem comprises antenna manufacturers such as Johanson Technology, Inc. (U.S.), Yageo Corporation (Taiwan), Vishay Intertechnology, Inc. (U.S.)., Fractus S.A. (Spain), Antenova M2M (U.K.), and Taoglas (Ireland), dielectric material suppliers, distributors, and system integrators such as Samsung C&T Corporation (South Korea) and Apple (U.S.) that integrate chip antennas and sell them to end-users according to their unique business requirements. 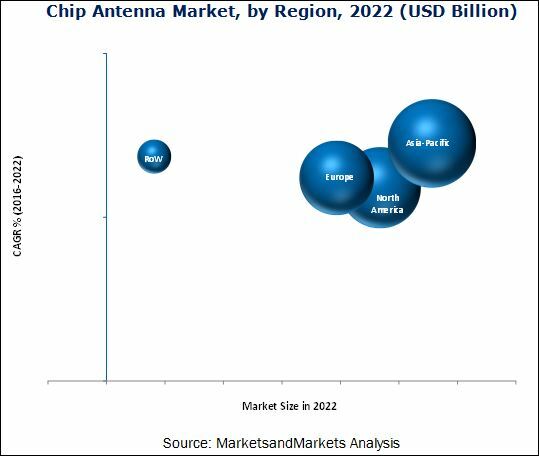 The chip antenna market is expected to be worth USD 2.99 Billion by 2022, growing at a CAGR of 13.1% between 2016 and 2022. A key factor driving the growth of this market is the increasing demand for chip antennas for IoT applications such as smart homes, smart grids, industrial internet, and connected cars. The dielectric chip antenna segment is estimated to hold the largest share in the chip antenna market, by product type. The demand for dielectric chip antennas is mainly attributed to the growing demand for compact antennas that operate at multiple frequency ranges and help reduce space in devices such as smartphones and wearables devices and others. In terms of wireless applications, the Bluetooth segment is estimated to account for the largest share in the chip antenna market, as Bluetooth technology is widely used for short-range wireless communication in consumer electronic devices such as headsets, smartphones, wearables, and gaming consoles. The growing demand for these consumer electronic devices is propelling the growth of the market for Bluetooth applications. The smart home /smart grid end-user industry segment of the chip antenna market is expected to grow at the highest CAGR between 2016 and 2022.The growing adoption of IoT systems in the smart home application for which wireless technologies, such as Bluetooth, WLAN, are used to connect different IOT devices is contributing to the growth of this segment. With regard to geography, APAC held the largest market share, and is expected to grow at the highest CAGR during the forecast period. The high demand for consumer electronics and automobiles from countries such as China, India, Japan, and South Korea is driving the chip antenna market in the APAC region. However, the performance variance of chip antenna when used in different devices for same wireless applications such as Bluetooth, WLAN/WIFI, and others is limiting the growth of the global market. Yageo Corporation (Taiwan) is one of the frontrunners in the market. The company is a leading global provider of passive components and services. It offers a broad range of products, such as resistors, capacitors, and wireless components. The company predominantly focuses on its core business and improving its product mix by developing new products using its strong research and development capabilities. Yageo has adopted the strategies of new product development and launch to expand its presence in the chip antenna market. For instance, the company launched two small, multi-band antennas—ANT5320LL14R1516A and ANT8010LL05R1516A for the GPS/GLONAS for applications such as navigation, tracking, and tracing. The companies that are profiled in the report are Johanson Technology, Inc. (U.S.), Mitsubishi Materials (Japan), Yageo Corporation (Taiwan), Vishay Intertechnology, Inc. (U.S.)., Fractus S.A. (Spain), Antenova M2M (U.K.), Taoglas (Ireland), Linx Technologies (U.S.), Fractus Antenna S.L. (Spain), Pulse Electronics (U.S.), Inpaq Technology Co., Ltd. (Taiwan), and Partron Co., Ltd. (South Korea). 12.9 Inpaq Technology Co., Ltd.